Malacañang has declared Feb. 13, Wednesday, as a non-working holiday in the City of Parañaque, which is celebrating its 21st cityhood anniversary. 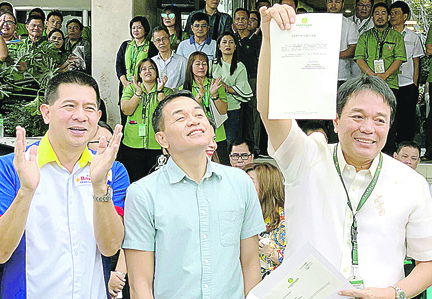 “It is but fitting and proper that the City of Parañaque be given full opportunity to celebrate and participate in the occasion with appropriate ceremonies,” said Executive Secretary Salvador Medialdea, who signed Proclamation 665 on behalf of President Rodrigo Duterte. Mayor Edwin Olivarez said the city will be celebrating the occasion with an ecumenical service, medical and dental missions, the Sunduan Exhibit, Run and Zumba, Lambat Festival and Fireworks display at SM City Sucat. These activities from Feb. 7 to 13 include Drum and Lyre competition, Interpretative Dance contest, Street Dance Kids challenge and pageant night of Gandang Mamita and BB Paranaque 2019 will be held on Feb. 10. In the afternoon on Feb. 12, Olivarez will deliver his 6th State of the City Address highlighting the present financial status of the city government including the settlement this year of the P1 billion loans to the Land Bank of the Philippines incurred by the previous administration. For the first time in the history of the city, the coffer has now cash in bank amounting P1.1 billion under general fund while the special education fund reached P1 billion and the calamity fund is now P400 million as of December 2018. After his speech, the top ten outstanding taxpayers in 2018 and the “Katangitanging Paranaqueno 21019” will be announced. In 2015, the city government launched its new theme and campaign slogan as it gears towards becoming one of the best and most dynamic cities in the Philippines. Paranaque is now called the “Bay City” with the slogan “Life Never Stops” aiming to be the country’s top tourist and entertainment destination with the rise of numerous world-class hotel resorts and leisure facilities in the area. Also, the new label is justified by the fact that the city is actually nestled between the majestic Manila Bay and the equally impressive Laguna de Bay.